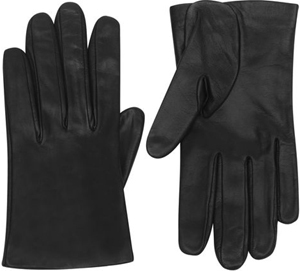 A GLOVE is a garment covering the hand. 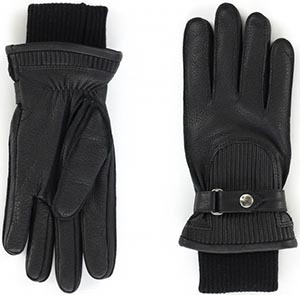 Gloves have separate sheaths or openings for each finger and the thumb; if there is an opening but no covering sheath for each finger they are called "fingerless gloves". 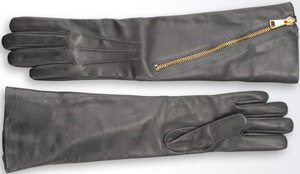 Fingerless gloves with one large opening rather than individual openings for each finger are sometimes called gauntlets. 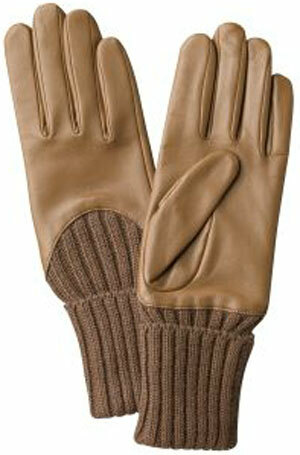 Gloves which cover the entire hand or fist but do not have separate finger openings or sheaths are called mittens. 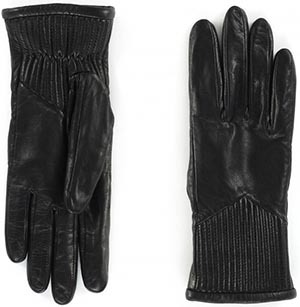 Mittens are warmer than gloves made of the same material because fingers maintain their warmth better when they are in contact with each other. Reduced surface area reduces heat loss. 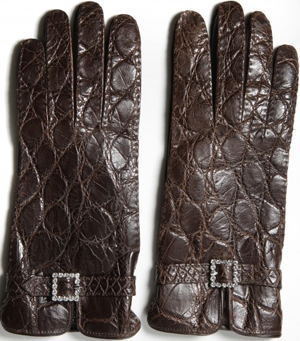 Gloves appear to be of great antiquity. According to some translations of Homer's The Odyssey, Laërtes is described as wearing gloves while walking in his garden so as to avoid the brambles. Among the Romans also there are occasional references to the use of gloves. 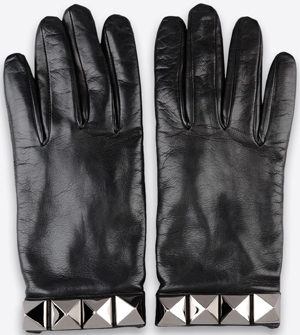 During the 13th century, gloves began to be worn by ladies as a fashion ornament. It was not until the 16th century that they reached their greatest elaboration, however, when Queen Elizabeth I set the fashion for wearing them richly embroidered and jewelled, and for putting them on and taking them off during audiences, to draw attention to her beautiful hands. 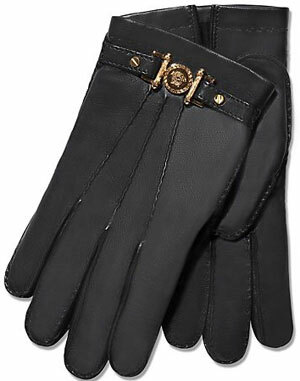 Embroidered and jewelled gloves also formed part of the insignia of emperors and kings. 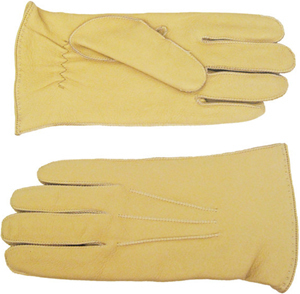 Pontifical gloves are liturgical ornaments used primarily by the pope, the cardinals, and bishops. 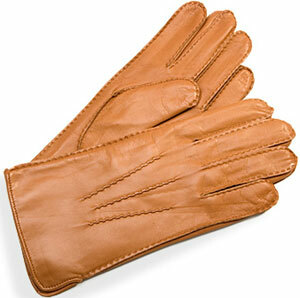 10 best pairs of driving gloves for the modern man - The Telegraph. All gloves & Mitts - Terra Nova Equipment. 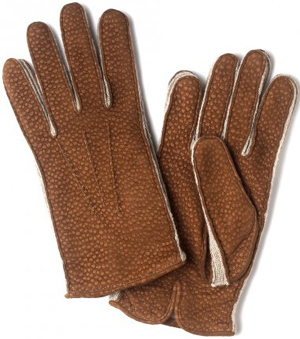 Glove Care - Causse Gantier since 1892. Lamb, peccary, deer, exotic skins. 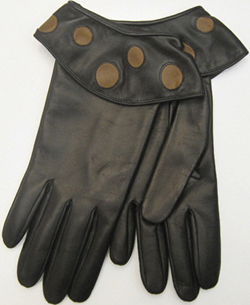 List of Glove categories - Wikipedia. Antonio Muro - "Handmade in Naples." Men's. Antonio Muro - "Handmade in Naples." Women's. Aris - men's & women's. 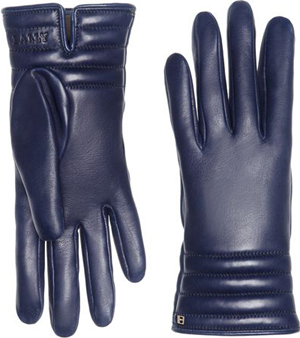 ASPINAL OF LONDON - men's leather gloves. 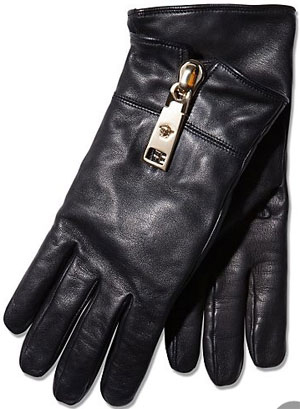 ASPINAL OF LONDON - women's leather gloves. 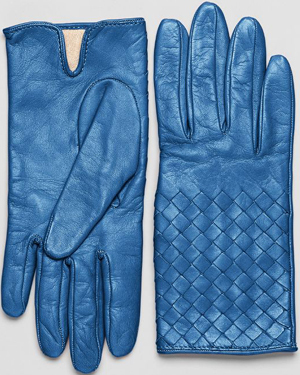 BENTLEY - men's & women's leather gloves. 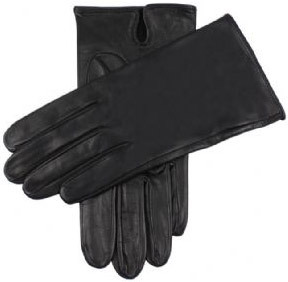 BLACK - men's driving gloves. CAUSSE - Gantier since 1892. Men's. CAUSSE - Gantier since 1892. Women's. CoSTUME NATIONAL - since 1986. Men's. DENTS - since 1777. Women's. DIANE DE CLERCQ - women's. ERIC BOMPARD - "Irresistible Cashmere." Men's. ERIC BOMPARD - "Irresistible Cashmere." Women's. Filson - "Building on a heritage of guaranteed quality since 1897." 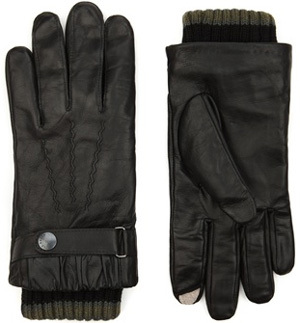 Men's gloves & mittens. Filson - "Building on a heritage of guaranteed quality since 1897." 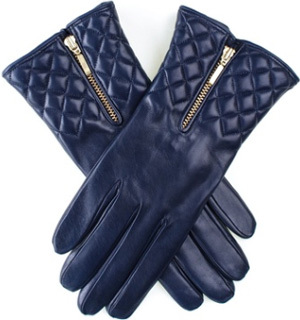 Women's gloves & mittens. 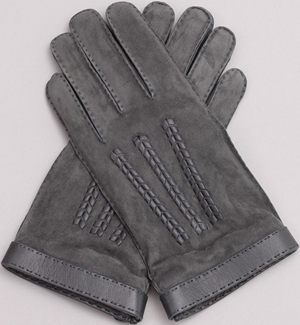 Flouzen Paris - men's cashmere gloves. HARVIE & HUDSON - men's. "The Family Owned Jermyn Street Shirtmakers Since 1949." 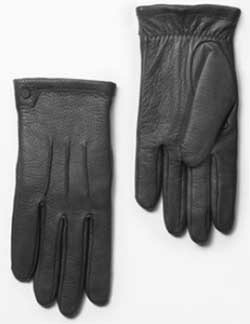 HILTS-WILLARD - "Glove Specialists Since 1878." Men's. 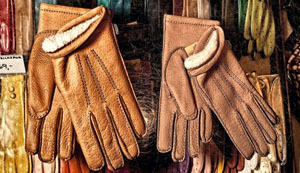 HILTS-WILLARD - "Glove Specialists Since 1878." Women's. Johnstons of Elgin - since 1797. "Fine Cashmere Clothing." 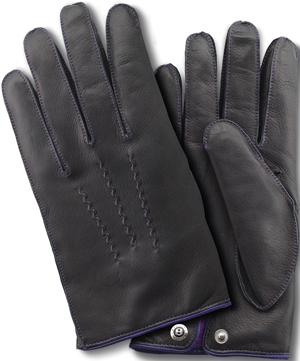 LOTUS - men's leather driving gloves. LUVARIA ULISSES - Lisbon, Portugal. Founded in 1925. 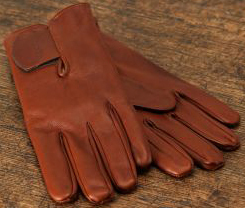 The last shop in Portugal dedicated to the exclusive sale of custom made gloves. MAISON FABRE - "Artisan Gantier depuis 1924." Men's. MAISON FABRE - "Artisan Gantier depuis 1924." Women's. 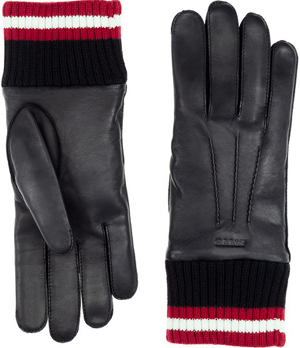 OYUNA - men's & women's cashmere gloves. Psycho Bunny - men's & women's. RANDERS HANDSKEFABRIK - since 1811. "To the tip of your finger!" 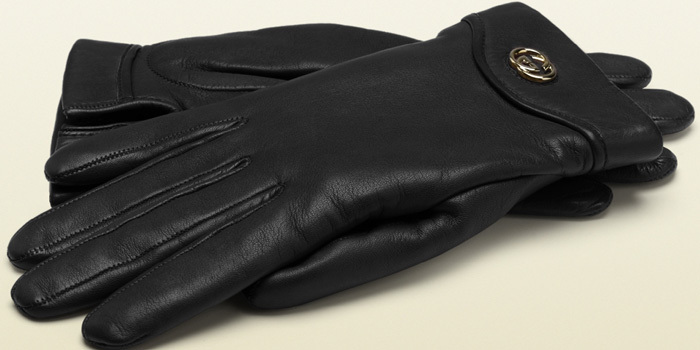 World's oldest manufacturer of high quality luxury gloves. Purveyor to the Majesty The Queen of Denmark. 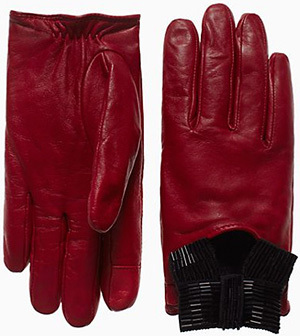 Saks Fifth Avenue Collection - women's. SUNSPEL - since 1860. Women's. TURNBULL & ASSER - "Made in England." 71-72 Jermyn Street, London, U.K. Men's. 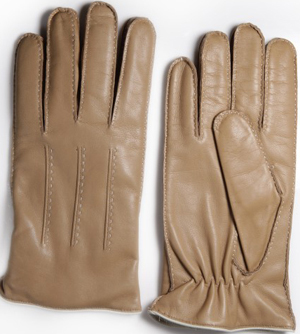 WESSEX - men's white evening gloves. 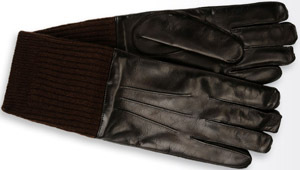 William Sharp - women's cashmere gloves.